Question 41: What is fragmentation? What fields of the IP header are used for fragmentation? Answer: Routers perform fragmentation when a packet is longer than the maximum packet length (Maximum Transmission Unit, or MTU) supported by a data link onto which the packet must be transmitted. The data within the packet will be broken into fragments, and each fragment will be encapsulated in its own packet. The receiver uses the Identifier and Fragment Offset fields and the MF bit of the Flags field to reassemble the fragments. Question 42: What is the purpose of the TTL field in the IP header? How does the TTL process work? Answer: The Time to Live (TTL) field prevents “lost” packets from being passed endlessly through the IP inter network. The field contains an 8-bit integer that is set by the originator of the packet. Each router through which the packet passes will decreament the integer by one. If a router decreaments the TTL to zero, it will discard the packet and send an ICMP “time exceeded” error message to the packet’s source address. Question 43: What is the first octet rule? Question 44: How are class A, B, and C IP addresses recognized in dotted decimal? How are they recognized in binary? Question 45: What is an address mask, and how does it work? Answer: An IP address mask identifies the network part of an IP address. Each one in the 32-bit mask marks the corresponding bit in the IP address as a network bit. A zero in the mask marks the Corresponding bit in the IP address as a host bit. A Boolean AND is performed in all 32 bits of the address and the mask; in the result, all network bits of the mask will be repeated, and all host bits will be changed to zero. Question 46: What is a subnet? Why are subnets used in IP environments? Answer: A subnet is a sub grouping of a class A, B, or C IP address. Without subletting, the network part of a major class A, B, or C IP address can only identify a single data link. Sub netting uses some of the host bits of a major IP address as network bits, allowing the single major address to be “Subdivided” into multiple network addresses. Question 47: Why can’t a subnet of all zeros or all ones be used in a classful routing environment? Answer: A classful routing protocol has no way to differentiate between the all-zeroes subnet and the major IP address, and between the all-ones subnet and the all-hosts, all-subnets broadcast address of the major IP address. Question 48: What is ARP? Answer: ARP, or Address Resolution Protocol, is a function that maps the IP addresses of interfaces on a data link to their corresponding MAC identifiers. Question 49: What is proxy ARP? Answer: Proxy ARP is a function of an IP router. If the router hears an ARP request, and The destination network or subnet is in the router’s routing table, and The table indicates that the destination is reachable via a different router interface than the one on which the ARP request was received, The router will respond to the ARP request with its own MAC address. Question 50: What is a redirect? Answer: A redirect is an IP router function. If a device has sent a packet to the router and the router must forward the packet to a next-hop router on the same data link, the router will send a redirect to the originating device. The redirect will inform the device that it can reach the next-hop router directly. Question 51: What is the essential difference between TCP and UDP? Answer: TCP, or Transmission Control Protocol, provides a connection-oriented service over the Connectionless internet layer. UDP, or User Data gram Service, provides a connection less service. Question 52: What mechanisms does TCP use to provide connection-oriented service? Answer: Correct sequencing is accomplished with sequence numbers. Reliability is accomplished by using check sums, acknowledgments, timers, and re transmissions. Flow control is accomplished by windowing. Question 53: Instead of ARP, Novel Net Ware uses a network address that includes a device’s MAC address as the host portion. Why can’t IP do this? Answer: A MAC identifier is a fixed-length binary integer. If IP used MAC identifiers as the host part of the IP address, subnetting would not be possible because there would be no flexibility in using some of the host bits as network bits. Question 54: NetWare has a transport layer service similar to TCP called Sequenced Packet Exchange (SPX), but no service similar to UDP. Applications requiring connectionless service directly access the connectionless IPX at the network layer. What purpose does UDP serve by providing a connection less service on top of what is already a connectionless service? Question 55: What information must be stored in the route table? Answer: At a minimum, each entry of the routing table must include a destination address and the address of a next-hop router or an indication that the destination address is directly connected. Question 56: What does it mean when a route table says that an address is variably subnetted? Answer: Variably subnetted means that the router knows of more than one subnet mask for subnets of the same major IP address. Question 57: What are discontiguous subnets? Answer: Discontiguous subnets are two or more subnets of a major IP network address that are separated by a different major IP address. 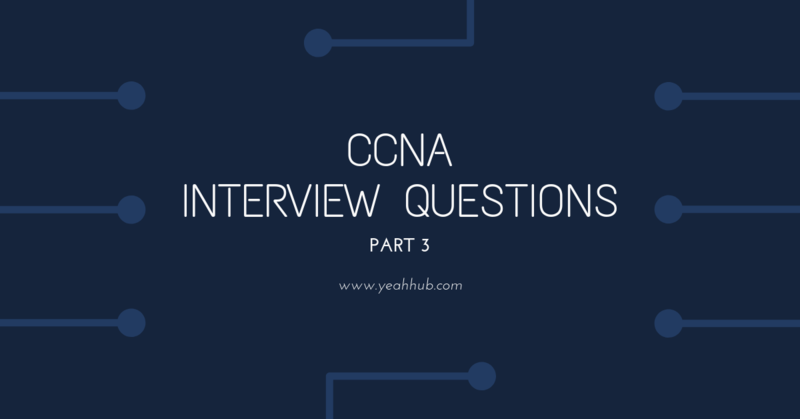 Question 58: What command is used to examine the route table in a Cisco router? Answer: show ip route is used to examine the routing table of a Cisco router. Question 59: What are the two bracketed numbers associated with the non-directly connected routes in the route table? Answer: The first bracketed number is the administrative distance of the routing protocol by which the route was learned. The second number is the metric of the route. Question 60: When static routes are configured to reference an exit interface instead of a next-hop address, in what way will the route table be different? Answer: When a static route is configured to reference an exit interface instead of a next-hop address, the destination address will be entered into the routing table as directly connected.